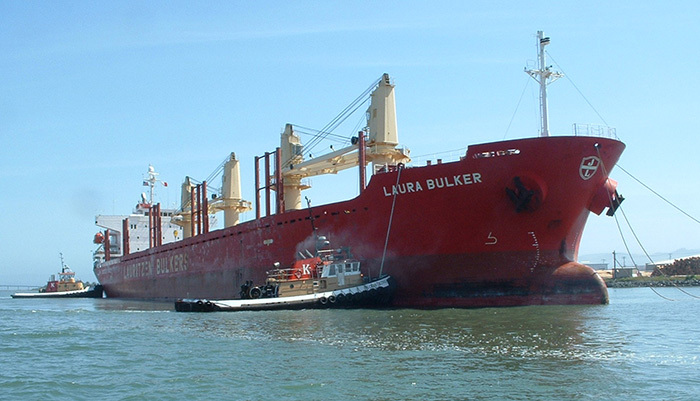 The Port of Humboldt maintains two Bar Pilots to provide expert pilotage for vessel arrivals, shifting between berths, and departures. The Humboldt Bay Harbor District requires that all foreign vessels and U.S. flagged vessels navigating Humboldt Bay, not sailing under a coastwise endorsement issued by the U.S. Coast Guard, except vessels under 300 gross tons, are required to use a Port of Humboldt Bay Bar Pilot holding current licenses for Humboldt Bay. Bar Pilots are available with 24-hour notice prior to arrival. Pilots are NOT maintained on station. Masters or agents are required to advise the Bar Pilots whenever there is a change in the arrival and/or sailing time. Pilot Boards vessel within one-mile radius SEAWARD of sea buoy. Do NOT proceed eastward of sea buoy until pilot has boarded. Radio watch is maintained one hour prior to arrival at sea buoy on channel 16. Contact pilot boat via voice radio (channel 16) approximately 30 minutes prior to arrival for any SPECIAL instructions. Maintain headway – 4 to 6 knots depending on the state of the sea. Wind and Swell 30° - 60° on bow or 30° - 60° abaft beam on side opposite ladder. Pilot ladder with spreaders. Bottom rung 2.5 meters above water, approximately amidships of vessel. No boat rope or man ropes are required. No tag lines, pull-up ropes, or trailing lines may be attached to the lower end of the ladder. On freeboard vessels, Port of Humboldt Bay Pilots prefer to use a mechanical pilot ladder or pilot hoist. Provide a life ring with safety line attached. At night - one or more brilliant lights shining well over ship's side to illuminate the ladder.